Let your child get a taste of your childhood by trying the games you used to play. Turn off the television and set aside those gadgets. There’s much fun to be had outdoors and you can find inspiration from when you were young. How about sharing these to your little one and give him an amazing childhood as well? Create a tent from a sturdy branch, blankets, and banig, and go garden camping on a clear evening! Bring with you a flashlight and let your child discover shadow play. See how many shadowy shapes you both can form with your hands. After those afternoon showers let up, introduce your child to a bit of puddle fun. Help him fold up a paper boat and let it float! Teach him how to blow on its sail to make it move or how to stir the water with a stick to make little waves. Discovery may get him a little dirty, but it's definitely worth it. Touch-the-Color is a great way for your child to learn about different hues and shades. Start with the primaries blue, yellow, and red. Later, teach him which colors to mix and produce orange, green, and violet. You may choose acrylic or watercolor but choose colors that are non-toxic so they are safe for children to use and play with. Level it up a bit by allowing him to experience different objects that relate to colors, such as how an apple is smooth and red and how cotton is soft and white. Where to do it: At a birthday party—fun and educational! There’s nothing more fun than creating sandcastles. Bring a pail and a few shovels and allow him to dig away! Give him the freedom to build whatever kind of castle he wants – he'll definitely enjoy letting his imagination run wild. Habulan is a very simple game where you and your kid can just run outdoors and tag each other. Aside from improving his motor skills, it's also a great way for him to discover that being out in the sun is a great deal of fun. With your guidance and proper nutrition, you know that your kid will have enough energy and the adequate protection during his adventures. Give your child NIDO® 3+, the only growing-up milk with Lactobacillus PROTECTUS®. Each glass contains millions of good bacteria that helps build bodily defenses. Add the proper diet and you can be sure that he’s protected and ready to explore the world. 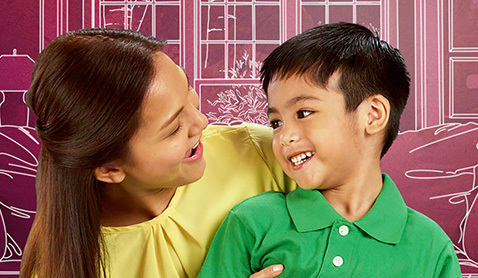 Learn more about NIDO® 3+ and how your kid can have a #LakingAmazing childhood! Check out www.LakingAmazing.ph.